Kids grow faster in sleep. Is their mattress Germ Free? Can it pass Germiclean Test? This is original picture of dust sucked from inside the clean mattress. Is your mattress Germ Free? Can you confidently answer that? Many vacuum cleaners do not filter fine dust effectively. Some adequately pull small particles out of your carpeting and bedding. However, their filter systems are so porous that microscopic particles pass through the cleaner and are expelled back into the air you breathe! Dust mites are microscopic organisms found in homes and are 0.2-0.3 mm long and translucent. Because of this, they are essentially invisible to the unaided eye. Dust Mites are the primary cause of allergies related to dust. It is actually the excretion of these mites to which people are allergic. Therefore, dust mites can cause allergic reactions even when dead. We live surrounded in filth. Sorry, but it’s a fact. All humans shed about 5-10 grams of dead skin each week. House dust mites are nearly universal in occurrence – although they do not bite, their waste, when inhaled by sensitive people, cause allergy symptoms. Hardy creatures with eight hairy legs, house dust mites are very small with translucent bodies that can only be seen with a microscope. The average dust mite is .3mm. About 3 mites could fit inside the dot at the end of this sentence. They only live for about 2-4 months, but during its life, a dust mite produces about 200 times its weight in waste product and can lay up to 300 eggs! Dust mites live in the fine layer of minute dust particles that seem to appear in your home from nowhere. They are scavengers whose diet consists mainly of human skin flakes. Since we continuously shed skin, as many as 50 million flakes of dead skin a day, the house dust mite has an abundance of food. Dust mites themselves are normally harmless – it is the skin they shed and the waste they produce that causes allergy symptoms in millions of people. The mites thrive in warm, humid conditions where their population can explode! Unfortunately, for humans, the beds in which we sleep are some of the warmer and most humid places year round. Dust mites live in mattresses, pillows, carpets, furniture fabric and stuffed toys. They like to burrow into the fabric and escape the light. We are exposed to the allergenic by-products of dust mites while we sleep. Although new homes or furniture; if handed over clean; are dust-free, within a month both are populated with dust mites that come from other areas in which people spend time, such as their vehicles, offices or other people’s homes. About 80 percent of what you see, floating in a ray of sunshine entering your home is dead skin, and we can see only 10 percent of the airborne pollutants. Other floating particles include dead dust mites and their waste products. These waste products, which are proteins, actually provoke the allergic reaction. Although a scientist observed mites in dust in 1694, it was not until the 1960’s that they were associated with allergies. Over the years, dust mites have become a target of extensive research for their connection to allergies and respiratory ailments. The house dust mite can actually cause asthma in the first place according to the National Asthma Campaign USA. Even if someone does not currently have any symptoms, reducing exposure to these allergens may reduce the chance of developing allergies and asthma. What is Dust Mites allergy? If you have allergies or asthma, a tiny creature living in your home could be making big problems for you. Although you can’t see them, but you may be feeling their effects only too well. They are dust mites, and they live in many homes throughout the world. Dust mites may be the most common cause of year-round allergy and asthma. Household dust is not a single substance but rather a mixture of many materials. Dust may contain tiny fibers shed from different kinds of fabric, as well as tiny particles of feathers, dander from pet dogs or cats, bacteria, food, plant and insect parts, and mold and fungus spores. It also contains many microscopic mites and their waste products. These waste products, not the mites themselves, are what cause allergic reactions. Dust mite waste contains a protein that is an allergen—a substance that provokes an allergic immune reaction—for many people. Throughout its life a single dust mite may produce as much as 200 times its body weight in waste. The appalling state of bed hygiene has a direct effect on people’s health. In the case of small babies, it can actually trigger the start of an allergic condition for them. Control the humidity and you control the dust mite. But there is one place in the home where mites will continue to thrive, and that is the bed – where the main source of humidity is the people that sleep in it (we lose 45 gallons of moisture a year as we sleep); and we also provide the mite with its diet of skin scales (we shed several pounds of skin a year, most of it into our bed). This perfect ‘mite environment’ is enhanced by the fact that we now only consider replacing our beds once the support or ‘comfort factor’ has gone; whereas in the past mattresses were regularly re-stuffed. Beds are a prime habitat and we spend about 1/3 of our life sleeping. As mites grow, they shed their skin and produce waste that causes allergy symptoms in millions of people. Many people with dust allergy react to dust mite particles and waste by producing a substance called histamine. Histamines cause a wide variety of allergic reactions – allergy headaches, asthma triggers and other symptoms. The house dust mite can actually cause asthma in the first place according to the National Asthma Campaign USA, spring 2000. Even if someone does not currently have any symptoms, reducing exposure to these allergens may reduce the chance of developing allergies and asthma. DUST MITES – Not a pleasant subject to think about. We can try to ignore the situation or we can work toward a solution to control the source. At first glance, it is easy to enter a state of denial. We did. “This isn’t a problem in our house,” we thought. “Our house is clean. Those mites are living down the street in the neighbour’s house.” However, in reality, the picture of millions of dust mites crawling around in the mattress could not be ignored and a solution needed to be found. JUST TRY NOT to think about dust mites the next time you get into your nice, warm cosy bed! 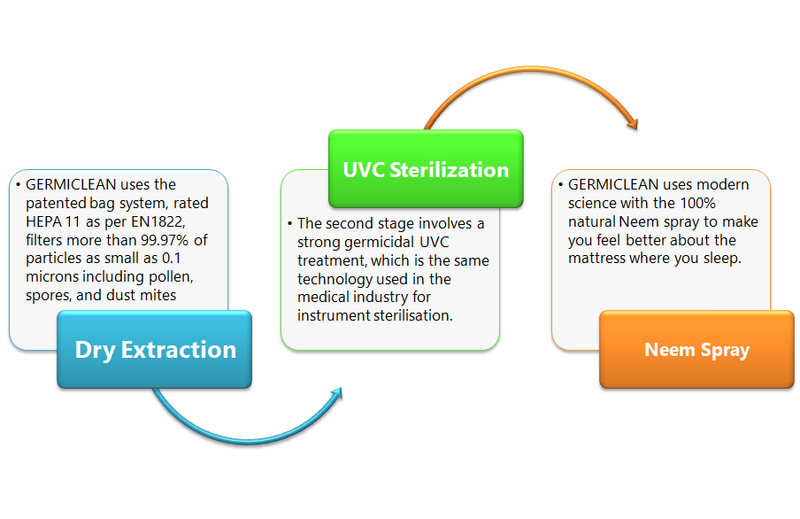 Germiclean has a three-step process to extract the dust mites and dust particles from mattresses and other fabric surfaces while on-site in your residence or commercial environment. We then treat all surfaces with uvc light that kills viruses, bacteria, bacterial spores, mold and fungus spores. We believe you and your family will sleep better knowing that your mattress has been cleaned and sanitised by Germiclean. Don’t be a victim of dust mites. Take the next step towards throwing these intruders out of your sweet home. House dust mites are considered to be the single greatest cause of indoor allergies. Even if someone does not already have any symptoms, reducing exposure to these allergens may reduce the chance of developing allergies and asthma in the future. 80 % of people with allergies and asthma test positive for dust mites. Germiclean manages the source of the dust mite problem using a state-of-the-art sanitizing system. We focus on mattresses where you spend 1/3 of your lives. This comprehensive approach includes a 3-steps process, i.e. high power vacuuming, treatment with UVC sterilization, and 100% natural neem spray. Q. Can I see dust mites? A. No, they are so tiny that unaided eye cannot see them. If you are able see them without any magnification, they could be some other mite. Q. Why do I need to sanitize mattress? 1. Any mattress, which is more than 6 months old, has toxic waste of mites between 200gm and 400gm. 2. As you may know that we recover while sleeping and we spend 1/3 of our life on mattress, hence it should be cleaned and sanitized regularly. 3. You wash your pillow covers and bed sheets twice a week and in some cases more often, however mattress is never cleaned or sanitized in its lifetime. 4. In case you are allergic then it becomes all the more important to avoid allergens. Q. What are the other things which can be sanitized? Q. Does mattress sanitizing cures my allergies? A. Sanitizing mattresses helps in reducing the allergy symptoms; however, it is not the cure. In case you are allergic then it works well along with your medical schedule. Just as brushing our teeth helps in keeping teeth healthy however we may visit our dentist for any problem. A. We have been providing sanitizing services since 2010. Since then we have conducted business with complete honesty and fairness, we have maintained high standard of quality and raised service delivery standards. Q. How do you prove that our mattress is sanitized properly? A. We follow a double check policy under which our team takes out a sample before starting the job to show the contamination level in your mattress and once the job is finished they take out another sample from sanitized mattress so that you can the see difference. Efficacy studies around the world have shown that this process brings down the allergen level by approx. 86%, which is highest by any method of sanitizing. Q. How often should a mattress be sanitized? A. Global standard is to sanitize mattress /sofa twice a year. We recommend following same routine, however in case of severe allergies we develop a customized cycle depending on re-occurrence of your symptoms. Q. How long does it take to sanitize a mattress? A. It takes approx. 45 minutes to sanitize the mattress thoroughly. Q. When can we use the bed? A. By the time our team make your bed and packs up, your bed is ready to use . Precisely 10-15 minutes is ideal time. Q. Do you take the mattress out to sanitize? A. No, it is an on-site job and service is done inside your home on the bed itself. Q. Is it safe for children while Germiclean is carried out? A. Germiclean does not use anything, which can harm kids, adult or even pets. In fact, we sanitize various kids stuff viz. stuffed toys, blankets, cots etc for many of our customers. Q. Why can’t I use my own vacuum? A. Firstly, Many vacuum cleaners do not filter fine dust effectively. Some adequately pull small particles out of your bedding and carpeting. However, their filter systems are so porous that microscopic particles pass through the cleaner and are expelled back into the air you breathe! These vacuum cleaners are not equipped to trap microorganism like dust mites or even their waste. Disposable bags used by Germiclean are made up of a material, which can trap bacteria up to the size of 0.1 micron. Size of dust mites waste varies from 10 to 20 micron. To put that in perspective, diameter of human hair varies from 40 to 120 microns!Secondly, machine used by Germiclean has a brush built in inside it, which helps in agitating the surface and releasing the mites and their waste from fabric. Finally and most important, Germiclean uses a proprietary powerful germicidal UVC lamp to kill bacteria, fungus, molds etc found in common house Dust. Q. Does your spray have chemical? A. No, It is completely non-toxic, which is not harmful for human being or pets. It is colourless and odourless. Q. Does my mattress have to be old for it to require cleaning? A. Any mattress, which is more than 6 months old, shall be sanitized regularly. Q. What is UV-C Light? A. Our sun provides a wide spectrum of light energy – from the invisible ultraviolet to normal visible light and up through the visible infrared. We are most familiar with the invisible UVA and UVB light waves that are harmful to our skin. However, it is the short UVC wavelength that contains the right level of energy for destroying bacteria, viruses, yeasts, and molds. Medical studies using ultra-violet disinfections have proven effective in reducing the spread of tuberculosis, measles, influenza, smallpox, and controlling infection in operating rooms. The Germiclean UVC light system uses large high intensity bulbs to destroy dust mites and countless harmful microorganisms quickly and efficiently. In case you have any other query please write to us at info@germiclean.co.in and we will be happy to help. 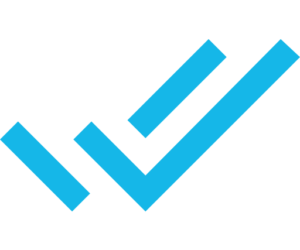 Our “Double Check” policy ensures accountability and quality of service each and every time.